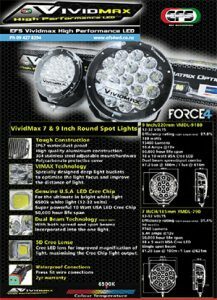 In addition to Light Bars, the EFS 4×4 Accessories range now includes Vividmax High Performance LED Round Spot Lights. Manufactured using a high quality, water and dust proof aluminium construction, these Vividmax spot lights are tough. The spot lights are designed with deep light buckets to optimise light focus and enhance the distance of the light, making them highly functional too.